i grew up outside of new york where there was the occasional kosher resteraunt which was always enjoying a short-lived run. there just werent enough kosher patrons to sustain one. when i moved to new york for college i was overwhelmed by the plethora of culinary options for the kosher diner. in addition to enjoying various price ranges and genres of kosher food, i also got to know the true meaning of the term greasy spoon and by greasy spoon i dont just mean that the food is greasy. the spoon is greasy, the chair, the table. 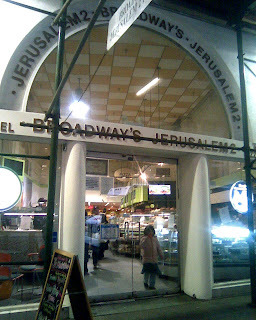 bh every jewish establishment is not a contender for the greasy spoon award. last thursday night i passed by j2 marketplace and was greeted by a sign saying their were closed down by the department of health and mental hygeine. when i read the mental hygiene part i was especially disturbed. there was also another note on the window saying they were closed until further notice. i dont know if they have re-opened yet. i suppose didnt care enough to walk past there before writing this post. j2's misfortune is not the point of this post. when i saw the sign on j2 last week it got me thinking. just because the health department doesnt close down an eatery doesnt mean its up to par. they just may not have gotten caught yet. 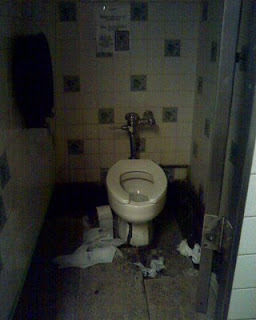 i also looked up the nyc dept of health and mental hygiene http://167.153.150.32/RI/web/index.do?method=goldenAppleList and typed in my favorite eateries. if an eatery has a rating of over 28 violations are reinspected. the average rating for a new york restaurant is a 16. the lower the number the better the rating. 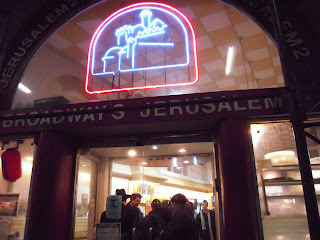 many kosher eateries had a score of 24 or 25. even "nicer" ones. netanya's pizza and pizza time on avenue j had ratings under 16 at the time of their last inspections. 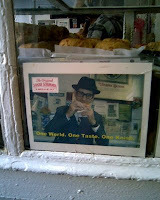 kosher delight in the city is the best rated kosher delight. the one in boro park was the worst. none have an optimal rating. mendy's on coney island and schnitzel king had the best ratings by far. under 10 at the time of last inspection. along with the number of violations is the description of the violations. mouse droppings anyone? unkempt workers , poor plumbing and mishandled food storage and preparation to name a few. after reading all these violations i realized i will be saving alot of money cooking my own food. i grew up in a city where there was not accessible public transportation . the nearest bus stop was two miles away. 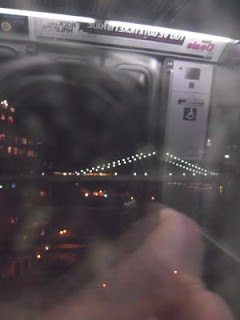 when i arrived in new york the subway cars reminded me of old holocaust pictures. aside from the visual resemblance there is also the smellivsion resemblance... the homeless. when i first saw a homeless person i was knocked out by the stench. i didnt think much about it except for how gross i thought it was. years later while again free associating my subway experience to shoah cattle cars i came to another holocaust synonym. during the holocaust the jewish people in the ghetto must not have bathed often. they must have smelled as vile as vagrants. even if they were able to escape the ghettos it would have been hard to mask the odor. consequently these thoughts help me have more sympathy for the homeless. usually i dont tell my parents about any of the guys i go out with because they always think that they are wonderful and why dont i marry them. he's jobless... marry him. he's jewish ... marry him...he's unreliable... marry him. occasionally they shock me and actually dont like someone. i wouldnt take my parents advice about a guy if they like him but if they dislike a dude i take heed. if he is bad enough for my parents not to like he must be bad. usually if my parents dislike a guy its because he's too opinionated and probably a republican. im a registered democrat who would better be categorized as an apatheticrat so coincidentally an opinionated republican would not be for me . any man with a history of being less than kind to any male member of my family isnt considered much of a catch either by the parental code. at the moment i cant recall any other exceptions to the hesoundswonderfulmarrryhim rule. so if a guy is nice to my brothers and a democrat my parents will get out their net and try to get him to marry me. not long ago i met a really cute guy at a singles event . when he opened his mouth to speak to me it was all over. death breath. they say that looks could kill, well halitosis can knock you out. it smelled like he never flossed . ever. every time he opened his mouth to speak i thought i was going to hurl. another fellow i chatted with recently also had the stalest breath ive ever smelled and he had been divorced several times. i cant imagine why. he was bad breath. literally. if a by merely speaking to someone one's oral hygiene is offensively apparent this could be a big reason one isnt getting any second dates. fortunately i have some solutions for those who have death breath. use an electric toothbrush with a timer. this way you know you are brushing long enough. sonicare is a good one. a dental hygienist friend of mine says braun makes a good one. for goodness sakes folks FLOSS! use dental floss or dentotape . mouthwash can also be quite helpful. the solution is out there and it wont cost an arm and a leg. once a person has sweet smelling breath they are definitely on the way to finding their zivug. yesterday i was on the b9 bus and a muslim woman wearing a hijib was standing. a young teenage yeshiva bachur was sitting in the aisle seat of a two seater seat. a middle-aged yeshivish man called out to the boy and said to move over so the muslim woman could sit. at first the muslim woman refused the gesture. upon much coaxing from the middle-aged yeshivish man, the youngster moved over and the muslim woman sat down next to him. ive NEVER seen anything like this happen before. whenever i travel home for holidays there is always the anticipation of running in to long ago friends . when i was in college it was the best. it was always a blast reuniting with old friends. now im just happy to see a familiar face. even if i see an old friend traveling im lucky if i recognize them. looks change over the years. some for the better. others for worse. when i see the college students travelling im always nostalgic..... sometimes i forget and search their faces trying to recognize in them an old friend which would be impossible.... thats the thing. i know that time has passed, but its hard to admit. i dont feel any older than 21 , but i know that i am. my home city's airport is always fun. i may not recognize my old friends faces, but i usually can spot their parents. they look more familiar anyway. they've aged too, but since they always were at least 20 years older it seems they arent much different. they still appear older. it always amazes me how people age at such varied rates. i dont know why this should surprise me. the physical mirrors the spiritual. people reach different milestones in their lives at varied ages- marriage... children... careers... own homes... why wouldnt this go for aging? when one is a kid everyone is in first grade at six yrs old, tenth grade at fifteen, get a drivers license at 16 or 17 depending on the city, but when you leave high school you are on your own. you might finish college at 21 , you might finish college at 40 or you might not go to college at all. some marry at 20 , others at 30 or 40, some never. some make seventy thousand at 30. some will never make that much money. ever. some go gray in their late twenties, some dont get a white hair until forty. some have liver spots at 23 others dont have a laugh line until 50.
i guess its easier to hide the passage of time in your achievements or lack there of . just dont mention one's demons and no one will be any wiser. when one notices visually how much someone has changed its more striking. much harder to hide. if one looks close enough one can tell. only so much one can hide. one notices the passage of time most amongst those one hasnt seen in awhile which is why i feel the passage of time most when i revisit my former city of residence. fyi , tomorrow, april 21, 2009 is free ice cream cone day for ben and jerry's . for all of you who are not cholov yisroel please take heed. it will be between 12:00-8:00 pm. be there or be square. i was watching oprah last week and lo and behold oprah was joining twitter. twitter is a site i have not yet joined. i was probably the last person to join facebook, so you can imagine how quickly im running to join twitter ! as oprah was touring twitter, she featured ashton kutcher. apparently ashton kutcher wanted to see if he could get more followers than cnn and i think that that meant he needed more than 10 thousand followers. of course all of us celebrity stalkers know that adorable ashton married to 14 yrs older demi would win! though ashton portrayed the studly doofus michael kelso on that 70's show he's not just some dumb himbo. he wanted to prove that the media is so nuts that a tv actor could get more followers than cnn! he also wanted to show how strong one lone voice can be on the internet. i dont have anywhere near 10 thousand followers on my blog, but i do think that blogs have a strong voice. one never knows who can find a blog and read its message. 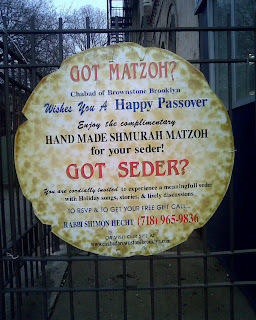 i found this adorable sign in park slope before pesach. i just couldnt resist! i really dig matzoh. i love matzoh with jelly and cream cheese. i love matzah and cheese. i love matzoh brei with sour cream and sugar on it. hand shmurah matzoh is good , too. it tastes alot fresher than the machine matzos. i love the fact that i get very few hits on my sitemeter on shabbos and yom tov. this is a scheduled post so i cant tell you exact numbers but judging from past experience i know that i have had very few hits during the past three days. i always wondered how many non-observant people read my blog and by the sitemeter i can tell you that its not very many. if they do, they are not checking out this site much on shabbos or yom tov. then again, i do get more hits when i put up a new post, so this contributes as well. obviously im not posting on shabbos or yom tov! 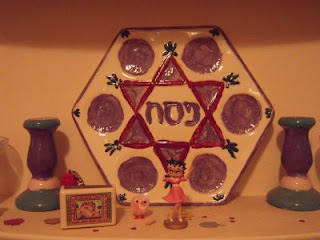 have a chag kasher v'sameach!! well you see.... pesach is always the beginning of another year for me. or the ending of another year as it were. i always hope that by the next pesach i will also be spending it with a husband. every year rolls around and here i am again going to spend the holiday as a singleton with my parents. if i just dont write about it then maybe it wont be...? well, this is life and life doesnt always bring what one wants. for those of you that live near your parents and are single, you get to hear your parents complain about your being single much more often than i do. i do speak to my parents on the phone but its not the same as in person. my parents dont know anyone for me so its doubly frustrating. some say next year in jerusalem, i say next year with a wedding ring. some say that disney world is the happiest place on earth. 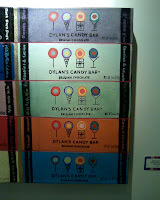 i would say that dylan's candy bar is the happiest place on earth. i work right near dylan's and go there whenever i need a quick pick me up. 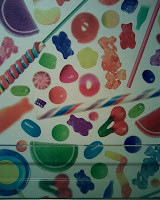 by pick me up i dont mean that i actually buy candy. i just browse. they diffuse the smell of candy throughout the store. how can that not make you happy? its instant bliss. 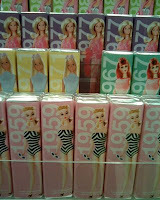 aside from ogling the unique chocolate novelty items, i enjoy viewing the candy/chocolate accessories. now they even have a line of paraben-free bath and shower products. yesterday i sampled some cupcake scented hand creme. i dabbed it on with an ice cream taster sized spoon that was beside the tester. the scent is divine. not too perfumy. jut right. even goldilocks would approve. 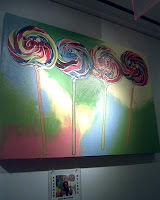 there is often candy inspired art work on the walls and candy inspired music playing in the background. 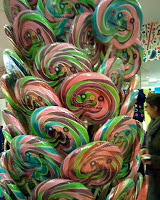 there are lollipop bouquets and every color jellybean one could imagine. i do admit that i have given in and bought some chocolate there, but for the most part i just go to dylans for the aura of all things candy . to me this is one of the happiest places in the world and i dont need a plane ticket to get there. what i like about life is being able to rely on old standbys like hersheys or coca-cola. they are always the same . except for that brief episode of new coke that never caught on. 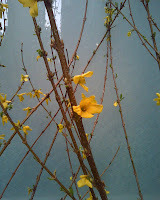 change is necessary, but i love the comfort of sameness. well.... you can just imagine how i felt today when i walked past j2 in manhattan. it almost looks like starbucks and tasti delight took over. it looks too gentrified. j2 has been redecorated several times since ive lived in new york, but this makeover is the most drastic. i almost thought i had walked past j2 when i saw the new look. 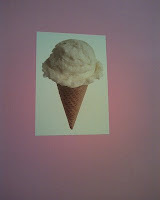 the menu has changed as well. it looks like circa took over. 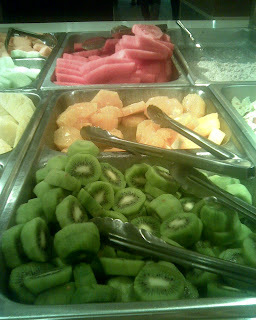 there is alot of fresh fruit cups and salad. these changes are definitely a plus. one room in the new j2 marketplace that has not been renovated is the little girls room. the one room that actually could use a makeover. i didnt manage to taste any of the nu j2's menu items so i cant tell you if the food is as tasty. i hope this newly renovated j2 brings everyone as many good memories as the previous version had.